THE Vic Peters Classic is a group 1 greyhound race which is held over 520m at Wentworth Park. It is a three-week series, consisting of heats, semi-finals and a final, with winning connections pocketing a lucrative $75,000. It is an age-restricted series which is open to the best 80 greyhounds whelped on or after July 1 – two years prior to the commencement of the heats – meaning only dogs aged 27 months or younger are eligible to compete. The most recent edition of the Vic Peters Classic was won by Victorian trainer Anthony Azzopardi with his talented greyhound Crash Bandicoot (Collision x J’S Robin Jul ’15). Because it is a group 1 series, only the best greyhounds line up to contest the heats of the Vic Peters. Naturally, with lots of talent on display, there is always plenty of betting interest on each round of the series, with many leading online bookmakers offering fixed odds prices over the three-week period. Additionally, some even offer all-in markets which are odds for the winner of the final prior to the heats (and then semi-finals) being run. These markets are always highly sought after because there is often plenty of value to be found – such as the 2017 winner Crash Bandicoot which was paying over $40 with some bookies to take out the decider before the heats were run and won. The Vic Peters Memorial Classic is the oldest feature race on the NSW Greyhound Breeders, Owners and Trainers Association calendar. It was first run in 1951 when known as the annual classic when it was won by Sharid (Young Sign x Julep Jul ’49) for owners Sylvia Gawne and Stan Cleverly – a champion trainer who had also put the polish on former greats Milimsimbi, Benjamin John and Bunyip Bint. The race was re-named the Vic Peters Memorial Classic in 1962 when won by one of the greatest dogs NSW has produced – Black Top (Top Linen x Classy Jane Feb ’61) which set a race record, track record and world record for 500 yards when victorious in 26.40 at Harold Park. The race was named in honour of one of the most significant administrators in the history of Australian Greyhound Racing and the man who is often regarded as the founding father of the Owner, Trainer and Breeder movement. Peters became involved in greyhound racing in the 30s. At the time, metropolitan greyhound racing was partly conducted by the NSW Trotting Club, which also registered participants, whilst somewhat confusingly, sires, litters and the naming of greyhounds was the duty of the National Coursing Association. Peters recognised the sport needed to change, and in 1937 he travelled throughout NSW in an attempt to unite all owners, trainers and breeders. Two years later, the NSW Greyhound Breeders, Owners and Trainers Association, a non-proprietary body, was formed. The GBOTA was later granted a metropolitan racing licence and in 1949 the first NSW Greyhound Racing Control Board was formed, with a seven-person board which included two representatives from the NSW GBOTA – Peters and Schute Saxon. Throughout his time, Peters grew the GBOTA to become the leading representative group of grass roots participants. He was also a key person in the formation of the Commonwealth Greyhound Racing Association, the forerunner to the Australian Greyhound Racing Association. Peters served as the secretary of the NSW GBOTA until his death in 1961. To this day, his contribution to the sport of greyhound racing is still recognised, with the Vic Peters Memorial Classic – changed to the Vic Peters Classic in 2001 – one of the most prestigious races in NSW. The race has been won by some genuine superstars of the sport including Woolley Wilson (Benjamin John x Top Sapphire Oct ’70), Brother Fox (Little Blade x Pitstock Park Feb ’83), Worth Doing (Brother Fox x Versatile Miss Nov ’86), Go Wild Teddy (Head Honcho x Web Of Silence Apr ’99), Collision (Awesome Assassin x Rumble Spirit Aug ’01), Spring Gun (Bombastic Shiraz x Ready For Rain Jun ’09), Zambora Brockie (Nitro Burst x Flying Liddy Sep ’13) and Ando’s Mac (El Grand Senor x Brook’s Doll Jun ’14). Anthony Azzopardi won his second Vic Peters in three years when Crash Bandicoot collected top honours. The black dog began well and although finding trouble throughout the run was too classy at the finish off box six. Ando’s Mac gave his owner and breeder Luke Anderson and his partner Michaele Alderdice their first group 1 win with a dominant victory in the 2016 edition of the race. 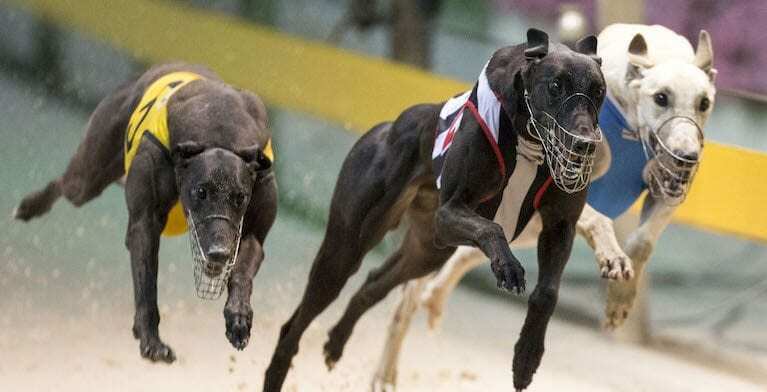 Trained by Jason Mackay in the Hunter Valley, the fawn greyhound absolutely smashed his rivals to win in a fast 29.69. Zambora Brockie confirmed his status as one of the best young greyhounds in the country when winning the Vic Peters Classic. Trained by Anthony Azzopardi, the black greyhound never looked in doubt off box eight as he stretched out to defeat Black Bear Lee in 29.58.